I have to admit, viruses aren’t normally my thing, but this is pretty darn cool. 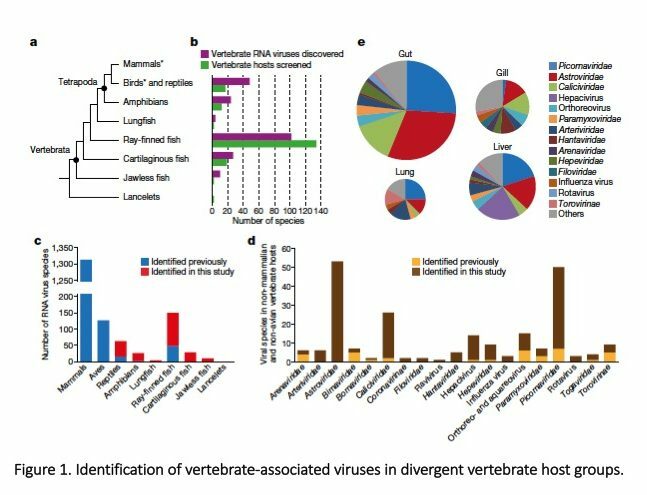 In a study out by Shi and colleagues this week, researchers identified 214 new viruses that, as the authors so succinctly state, reveal “diverse virus-host associations across the entire evolutionary history of the vertebrates”. RNA viruses are important since they can have a huge influence on human health, which means that most of the time research isn’t so concerned with the basic understanding of their origins and how they have changed over time in relation to their hosts. 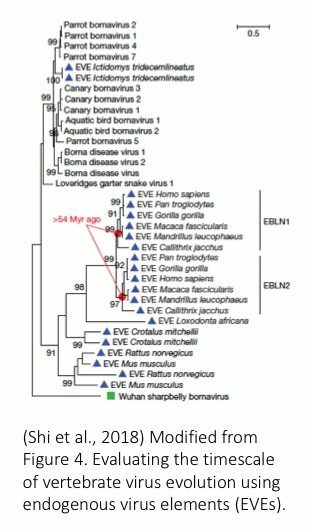 The authors of this study highlight that another gaping hole in the understanding of RNA viruses exists because most research focuses on viruses from birds and mammals, the rest of vertebrate diversity (including reptiles and fish) hasn’t been well explored. In order to fill in some of the gaps Shi et al., set about screening RNA viruses from 186 different species (including jawless fish, ray-finned fish, frogs, snakes, and turtles among other creatures), and sheesh, they came up with a great data set. The RNA was extracted from the gut, liver and lung (or gill) tissue from all individuals from which they generated libraries that were sequenced using Illumina Hiseq 2500 and 4000 platforms, ultimately gathering a total of 806 billion bases of sequence reads that were used to hunt for RNA viruses. The authors pulled out RNA virus sequences similar to those of already known viruses, which could mean that their estimation of diversity could be (if anything) an underestimation of the true diversity of RNA viruses associated with vertebrates in their data set. There were some assumptions in the mix, including that sequences identified were not from viruses that might actually have infected microbes on the samples. However, the authors point out that 24% (or more) of the viruses from a single individual were found in multiple tissue samples from that same individual, suggesting that they are likely associated directly with the vertebrate host. Of the 214 viruses, Shi and colleagues found that 196 were most likely vertebrate-specific and amazingly that “every vertebrate-specific viral family or genus known to infect mammals and birds is also present in amphibians, reptiles or fish…” In addition to this being a significant contribution to the understanding of RNA virus distribution in vertebrates, this study also expands upon the knowledge of the diversity of known groups. Maybe one of the snazziest results uncovered was the authors found that virus phylogenies can mirror host phylogenies over very very long time periods, although that’s not always the case. For example, they note that fish viruses can be related to amphibian, reptile and bird viruses, in the same way that fish are related to amphibians, reptiles and birds. 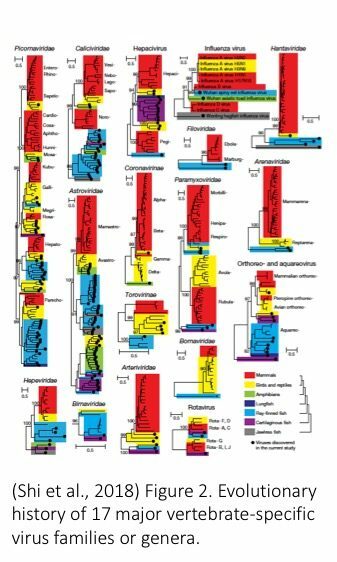 They also identified plenty of examples of host swapping, indicating that diverse forces drive RNA virus diversity and evolution. Either way, RNA viruses and their hosts have been tangled up in a dance that has taken place over the course of millions of years, sometimes to the tune of vertebrate evolution, and at other times paying no mind to it. Overall, this study nicely demonstrates that there is plenty of undiscovered diversity among RNA viruses in vertebrates. The evidence also shows that not only do these viruses harbor a wide range of evolutionary histories, they have also been around for quite some time. These results might have taken a while to uncover….but the good news is, the sequencing works. This entry was posted in bioinformatics, Coevolution, evolution, transcriptomics and tagged Evolution, host evolution, RNA viruses. Bookmark the permalink.